IWM rose by 3.6% this week; my account rose 0.4%. The loss-floor has risen to -3.8%. US news: Republicans caved at the last minute, so the US government is back in business. It immediately printed up $300 billion to make up for lost time. 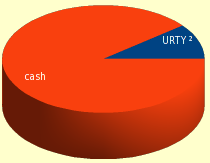 URTY ² Robot trade did not go through (Schwab returned error), so I entered it manually. Next week: The robot will buy FNSR and YHOO at Monday’s open.